One way to capture this kind of shot is to use a camera drone, but if you are shooting on a budget, a cable cam and a GoPro are your best bet. Matt Hardy shared this great tips with us, on how to build and setup a DIY Cable Cam. It is just this kind of small fast rigs that you can set to run over a hundred meter shot. 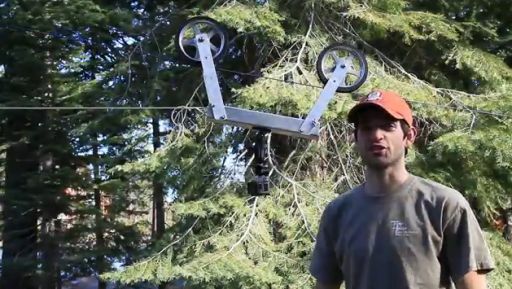 The rig is made from a trapezoid Aluminum with 2 grooved scooter wheels, and it smoothly slides across 100 meters of 3mm Dyneema rope. (The rope has to have some downwards angle to pull on the rig, so you better know your nuts – Matt used a Double Bowline Knot and an Alpine Butterfly knot). The nice thing is that the aluminum trapezoid folds flat when not in use. Any places where I could get pre-grooved wheels? A similar one of these popped up in an older DIYP post, but I couldn’t get past the fact that you have to carve a groove in the wheels. I don’t have the tools, and I most likely don’t have the skills. old bike wheels will work, just remove the tires and tubes.